Offered for sale is this very iconic "First Winchester", Model 1866 Saddle Ring Carbine, "Third Model". First Manufactured in 1866, with the classic brass [gun metal[ frame, a standard 20 " round barrel, with a full length magazine, and 2 barrel bands. This is a rare conversion from 44 Henry RF, to the obsolete 10.40mm CF, carried out by the Winchester Factory for a Brazillian contract.. Offered for sale is this very iconic Antique, “First Winchester Yellow Boy”, Model 1866 Saddle Ring Carbine, “Third Model”. 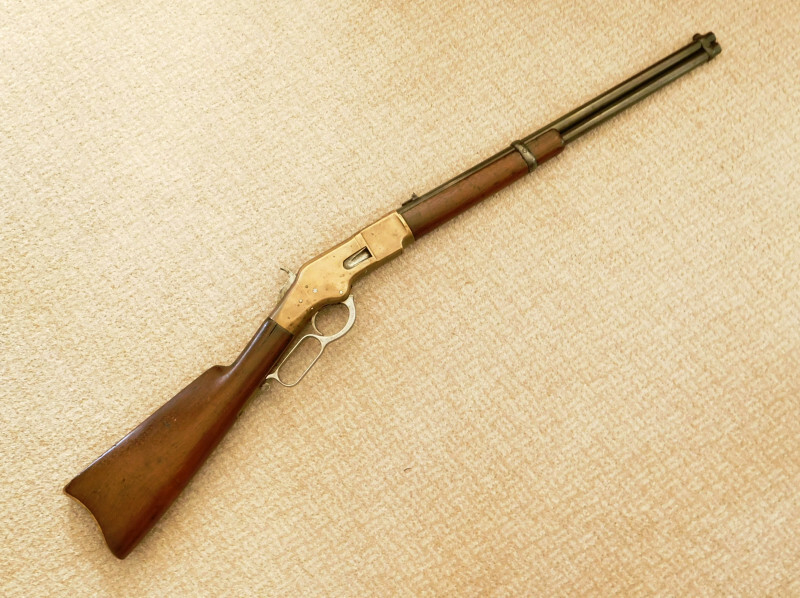 First Manufactured in 1866, with the classic brass [gun metal[ frame, a standard 20 ” round barrel, with a full length magazine, and 2 barrel bands. There is a brass buttplate, with a sliding, trap door to access a channel in the stock for a cleaner/ramrod [missing]. There is a saddle ring mounted on the left side of the frame. The underlever action is sound. Complete with it’s hinged rear sight, and standard foresight. With it’s original 2 piece Walnut Stock, with fine grain, minimal dings and dents, and to a pleasant patina of age. The Serial No # 121279 C1874. This Carbine is a Rare Conversion from 44 Henry RF, to the Obsolete 10.40 mm, Centre Fire, carried out by the Winchester Factory, for a South American [Brazil] Contact [ approx. 1000 were converted]. The barrel/magazine is now to a smooth dark grey/blue patina, with no pitting, and the hammer and underlever, originally case hardened, and in good bright metal condition. The Rifled bore is good, with small areas of staining.